When people are asked what they prefer to hear first, good news or bad news, most choose the bad news. After all, it can only get better afterwards. We also stick to this rule and start with something that is inevitable in the startup world: failure. Nine out of ten startups disappear from the scene sooner or later, according to a widespread estimate. Most of them do it quietly because they could never really arouse public interest. 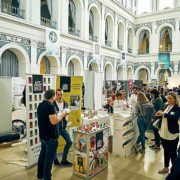 In 2017, however, a number of startup companies in Hamburg that were among the city’s most popular went out of business. Within the first few weeks of the year TripRebel, Heute in Hamburg, Jano and Protonet announced that they would file for insolvency or would immediately cease operations. They were all audience favourites, winners of startup competitions or even crowdfunding record holders (Protonet), but obviously that didn’t protect them from insufficient economic success. In case of Heute in Hamburg the shock was particularly big, but here there was a happy ending. Haspa Next, a sister of Hamburger Sparkasse, took over and integrated the service for event tips into their new App AINO. Protonet still exists as well, under the address Protonet, Inc. in San Francisco. Lampuga also had a life after the insolvency. The producer of jetboards found a buyer in Baden-Württemberg. On the other hand, it’s all over with Spottster for good. The team around founder Freya Oehle did not see a sufficient economic perspective for the price alarm platform. Elisa Möller, Jan Becker and Patrick Henke from HEUTE IN HAMBURG, Haspa CEO Harald Vogelsang and Tobias Lücke, Managing Director of Haspa Next GmbH, celebrate their cooperation. After the bad news come the good news, as you know, and there were plenty of them in the Hamburg startup scene in 2017. At the forefront were once again the fintechs, which were able to complete the most lavish financing rounds. The 110 million euros for Kreditch were even a European record, but the 20 million US dollars for Deposit Solutions and the eight million euros for Exporo were impressive as well. Exporo also ranked third in the nationwide growth ranking of Gründerszene and is the undisputed industry leader in real estate crowd investing. With an investment of 18 million euros, the cruise ship portal Dreamlines was also one of the winners of the year. The same applies to two top dogs from the games scene, although for a long time Goodgame Studios did not look like it. The company’s reputation was rather shattered by the quarrels over a works council and mass layoffs, with the takeover by the Swedish Stillfront Group in December bringing about the clearance. There was talk of total of 260 million euros, and the gradual exit of InnoGames will ultimately take place in these dimensions. Here the new owner is the Modern Times Group, also from Sweden. Further exits which brought together three Hamburg startups with major companies: Dräger acquired a majority stake in bentekk, tripl went to trivago and Daimler subsidiary moovel secured Familonet. Economic Senator Frank Horch with Roger Gothmann and Christian Königsheim from Taxdoo, Carlo Ulbrich and Benny Bennet Jürgens from Nect and Sandro Rabbiosi from Nüwiel. All three startups were not only successful at Gründergeist, where this photo was taken, but at many other competitions. 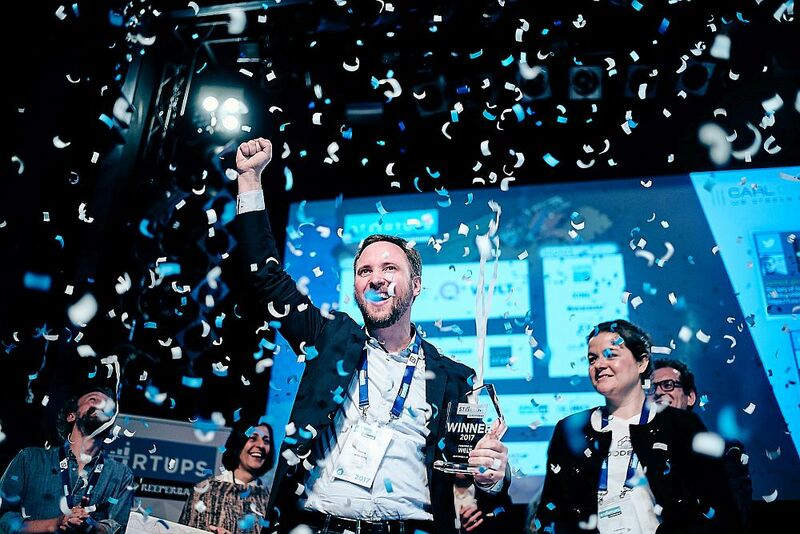 Of course, there are also plenty of winners in the many startup competitions that take place in Hamburg throughout the year. The start in January has been made for some years now by the pitch organized by Hamburg Startups, during which there is a trip to the SXSW Festival in Austin, Texas to win. Nüwiel earned the ticket with its electric drive for bicycle trailers. Hamburg has been strongly represented in the SXSW for years, and 2017 was no exception. At the Gründergeist competition in February, Nüwiel took third place. The first two occupied two startups, which were going to win numerous other prizes in the coming months: Nect and Taxdoo. They also cleared the nextMedia Elevator, but in reverse order. In June, Taxdoo won the crown with its solution for VAT problems, and Nect’s virtual ID card came second. Nect was able to grab the App Award from 20Scoops and Radio Hamburg and finally a trip to Silicon Valley donated by the Finanzplatz Hamburg. 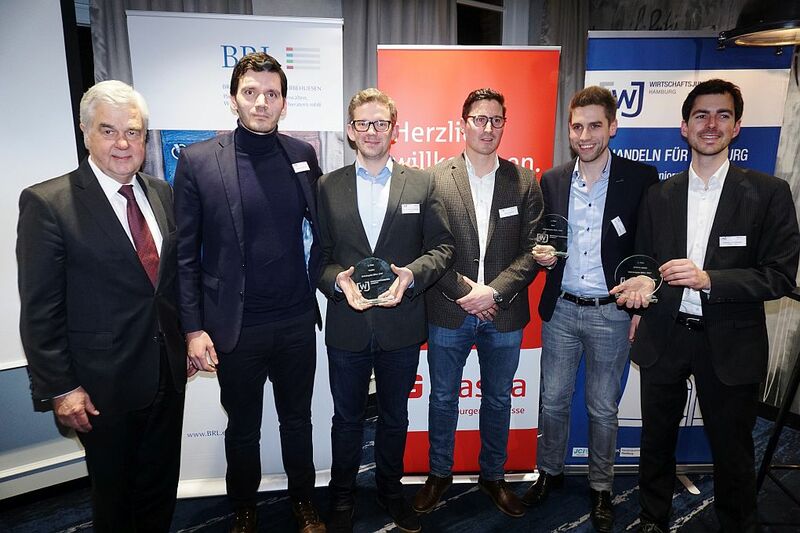 Taxdoo, in turn, won the audience award at the Startups@Reeperbahn Pitch in September. 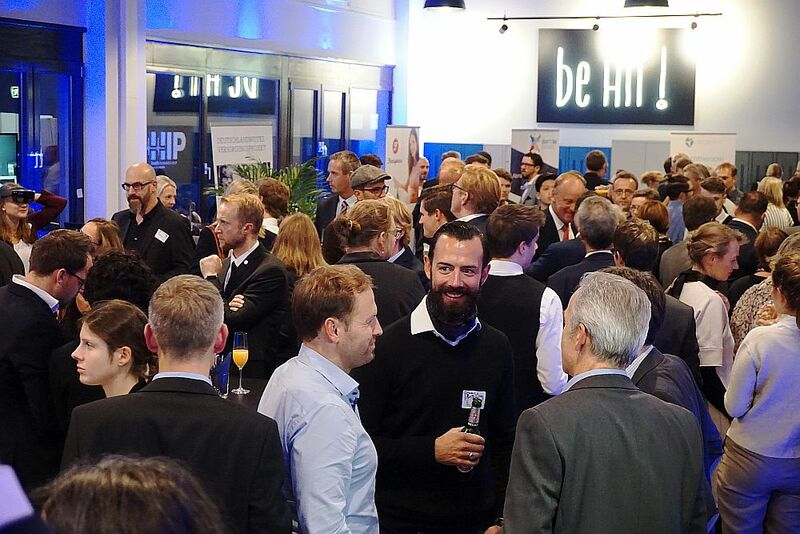 The big winner of this season highlight organized by Hamburg Startups was Inspirient. This startup from Berlin will travel to Austin for the SXSW Festival in March 2018. We will report in detail! Further competition winners in a nutshell: Breeze triumphs in the category of startups at the prestigious Hamburger Gründerpreis, CiDO climbs the top step in the betapitch, BarluParts 3D won the first Jimdo Founder Slam, Viewlicity and Vireed finished first in the Next Reality Contest, Groovecat set the tone at the Music WorX Pitch and Bluebird Mountain won over the audience at UniPitch. By the way, Taxdoo 2016 started its award career at this event. 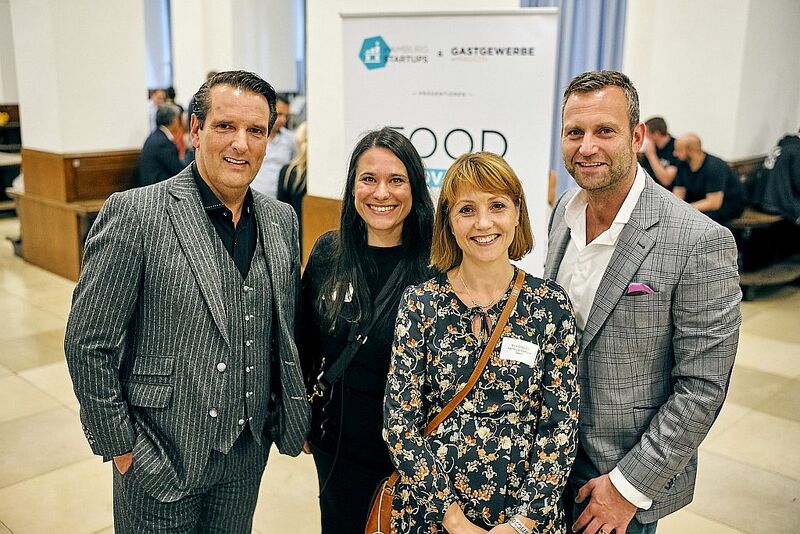 And then there were the Hamburg Startups FOOD AWARDS. These were awarded at the Food Innovation Camp, organized by Hamburg Startups for the first time in 2017. 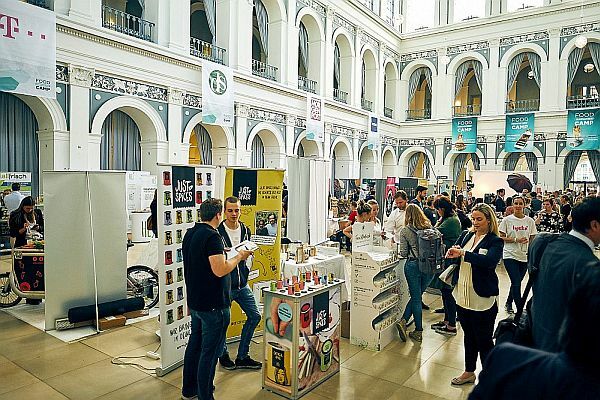 At its premiere, the mix of trade fair and conference exceeded all expectations and attracted more than 1,000 visitors to the Hamburg Chamber of Commerce. The award winners were Smuus, Lycka, both from Hamburg, and Flowtify from Cologne. The great success of the event was further proof that the topic of food is far from being exhausted in the startup world. We have dedicated a whole series to it, you can download the E-Paper here (in German). Food was also one of the dominant themes in the founding show “Die Höhle der Löwen”, which again set new records from September onwards. 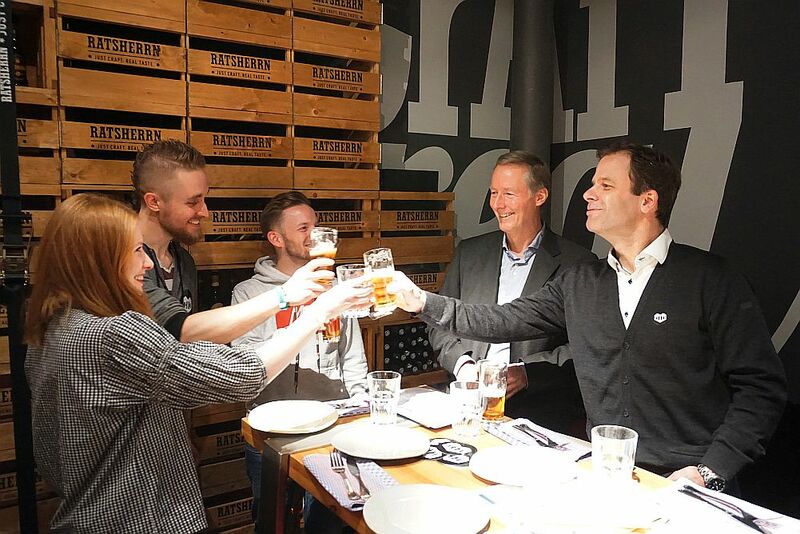 Apart from one exception, all the candidates from Hamburg and the surrounding area dealt with food and drink. And they all made a deal, at least for the time being. In the end, it didn’t completely work out for Kajnok, HappyCheeze, Chef. One and Tastillery. On the other hand, Luicella’s, Veluvia and Foodguide received the full financial and professional support of their “lions”. Whether it’s a deal or not, the media attention and an invaluable advertising effect was certain to everyone, now every startup has to make sure that its success is sustained. This pertains to all startups that are running through one of the funding programmes in Hamburg as well. For many years now, IFB has been offering its InnoRampUp programme and the Innovation Starter Fund. At the beginning of next year we expect the hundredth startup funded by IFB. The Next Media Accelerator has also established itself, having already supervised its fifth batch; at the Airbus BizLab it was, after all, the second. Media and aviation are two sectors that have traditionally played an important role in Hamburg. The same applies to trade and logistics. Here, the Next Commerce Accelerator is already active, while the Next Logistic Accelerator is still waiting for the final go-ahead. The Digital Hub Logistics, on the other hand, has already begun its work. 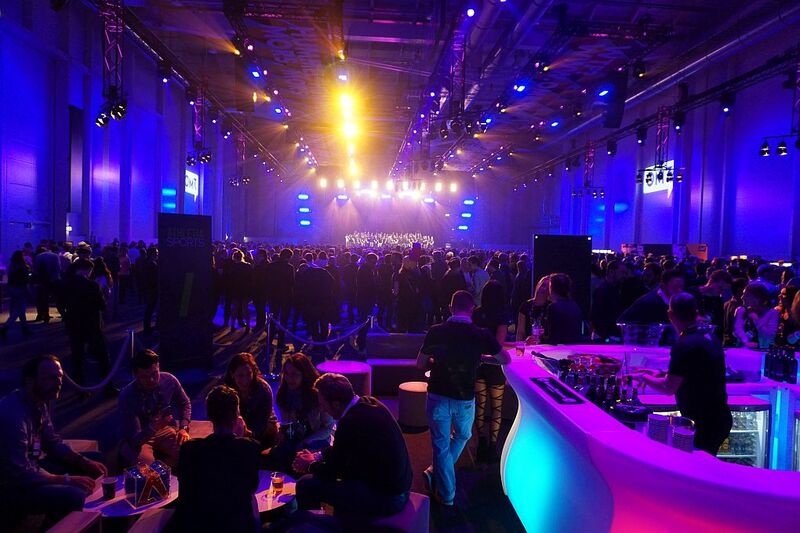 Finally, the Health Innovation Port of Philips celebrated its opening in October. Many opening ceremonies were scheduled for 2017, here at the Health Innovation Port. For a while betahaus in Eifflerstraße was the largest coworking space in Hamburg, in 2016 the Mindspace opened at Rödingsmarkt. In 2017 coworking experienced a real boom, also in the Hanseatic city. Beehive now has three locations here, Friendsfactory moved to HafenCity in April and global market leader WeWork moved to Axel-Springer-Platz in October. The latest addition is rent24 at the Bleichenbrücke. Besides, rent24 acquired Friendsfactory in autumn and is planning a coliving space in Hamm for 2018. WeWork also wants to expand its offering in Hamburg. It will be interesting to see how the market develops and whether the point of supersaturation will be reached at some point. This certainly does not apply to many events in Hamburg. They have developed further in 2017. Lighthouse events include the Social Media Week, Fintech Week, d3con, solutions and above all the Online Marketing Rockstars. This spectacle has already attracted 25,000 visitors to the exhibition halls in 2017 and is set to reach 40,000 in 2018. A season highlight: the Online Marketing Rockstars. In the background it’s Hamburger Goldkehlchen, a male choir with many startup guys, singing. What else can we expect for the coming year? More Virtual and Augmented Reality, more Blockchain, more Artificial Intelligence and whatever the buzzword generator has to offer? Maybe, but maybe the high-flyers in 2018 come from completely different areas. At least we hope that the desire for founding will increase again. If you take our Startup Monitor as a yardstick, 2017 was not a good year with only about 60 new startups, even though there are certainly still some registrations coming. Whatever happens, we will continue to keep our eyes and ears open and report with the best of our knowledge and belief! How to get to the MLOVE Salon in Lisbon Qualitize and Nordantech go to SXSW Festival!